Have tu seen the Sally Lockhart Mysteries - Ruby in the Smoke and Shadow in the North? How Do tu Feel About Moffat Saying Goodbye To Rose's Character? la elección de los fans: What? No Rose? Whyyyyy?! who do tu think Billie is suited to? Which do tu prefer Billie in? I amor Billie Piper's hair but I've only seen her as a blond. Does anyone have a foto of her with her natural hair color? 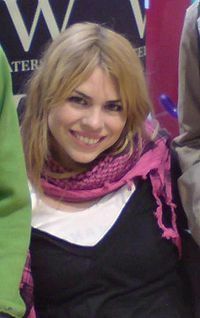 She began her career as a pop singer in her teens but is now best known for portraying Rose Tyler, companion to the Doctor in the televisión series Doctor Who from 2005 to 2006, a role she reprised in 2008. In 2007, Broadcast magazine listed Piper at #6 in its "Hot 100" lista of influential on-screen performers, the parte superior, arriba woman on the list. What are the names Of Billie's parents? Do tu want Billie back in Doctor who for good?